All garage door systems rely on a set of springs in order to move. These heavy-duty components are designed to bear the weight of the panels, and they are put under a huge amount of tension whenever the door is in motion. While they are tough, they won't last forever; a typical unit might wear out after just five years if it's not properly maintained. It’s important to recognize when your springs are wearing out, and to arrange for them to be replaced before that happens. What Happens When They Wear Out? As a spring wears out, it grows weaker and weaker. Eventually, it’ll weaken to the point where it breaks completely, which can be very dangerous; if the door is open when that happens, it can drop on whatever’s below it. Even if the door is closed it can be very inconvenient to deal with a broken spring, since you won’t be able to open it. The only option is to contact our technicians and arrange for the damaged unit to be replaced – while our team works very quickly, it’s still better to try and avoid this situation altogether. It’s impossible to predict exactly when one of these units will begin to wear out. So much depends on the manufacturing quality and how well the component is looked after; a high-quality torsion unit that’s consistently lubricated and adjusted will last significantly longer than a cheap, rarely maintained one. Common signs that your spring is beginning to weaken are noticeable door sagging, wobbling or squealing noises. If your system exhibits any of these signs, it may be time for a replacement. Even if they’re not reaching the point where they need to be replaced, these components will naturally grow weaker over time. You can test the balance of the system (which will let you know how weak these units have become) by disconnecting the opener and then opening the door halfway. If the door drops significantly, then the tension of the springs needs to be adjusted. This task can be very dangerous, so you better let our experts handle it. 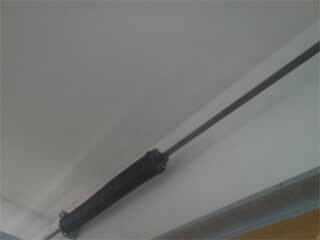 We strongly recommend that you don’t try and replace any garage door springs yourself. These components are under a lot of tension and can be very dangerous; it’s much better to contact our team for assistance. We’ll safely secure the door before quickly disconnecting and replacing the worn springs. We only use top-quality brand name parts, so you can be confident that you’re only getting the best service possible when you contact Garage Door Repair Danville.